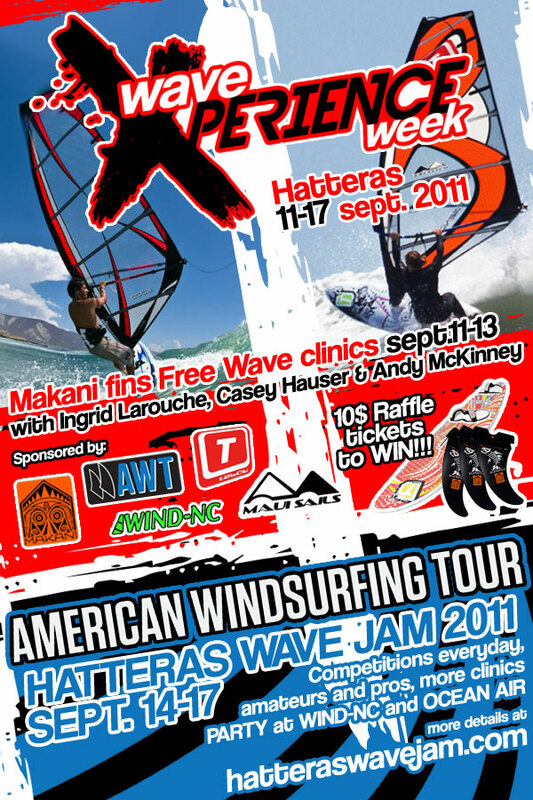 Make sure not to miss the MAKANI fins FREE wave clinics (Sept 11-13) and the AMERICAN WINDSURFING TOUR Hatteras Wave Jam (Sept 14-17). You always dreamed of going in the ocean and rip the waves well this is the perfect occasion. Ingrid, Casey and Andy will teach you all the tricks you need to get out there and enjoy the surf. Plus you will have a chance to ride with the best in the World and see them competing at the HATTERAS WAVE JAM AWT event!!! Everyone can also get a chance to win a TABOU DA CURVE 85 with 3 MAKANI wave fins. Raffle tickets go for $10 and available online at makanifins.com and at Wind NC in Avon. I'm really psyched about the wet clinics before the Jam. I learned so much from you local experts when you guided us on surfaris in 2008 and 2009. This is really nice i can't wait to get the lowest international airfares to NC.